NASA announced its latest class of astronaut candidates Wednesday, including three with ties to San Diego. The candidates will report for duty with NASA in August. Of the 12 candidates, at least three received part of their extensive educations in San Diego, while one was based in the region while serving as a Navy SEAL. Navy Lt. Cmdr. Matthew Dominick earned a Bachelor of Science in electrical engineering from the University of San Diego and a Master of Science degree in systems engineering from the Naval Postgraduate School. The native of Wheat Ridge, Colorado, also graduated from U.S. Naval Test Pilot School and currently services with Strike Fighter Squadron 115 aboard the aircraft carrier USS Ronald Reagan. Dr. Jonny Kim enlisted in the Navy after high school and served on SEAL Team Three, based in San Diego, serving as a medic, sniper and point man on more than 100 combat operations during two deployments to the Middle East. The Los Angeles native earned a degree in mathematics at University of San Diego and a doctorate of medicine from Harvard Medical School. He most recently worked as an emergency doctor at Partners Healthcare at Massachusetts General Hospital. Robb Kulin, an Alaska native, is a senior manager for flight reliability at Hawthorne-based aerospace company SpaceX, where he began working in 2011. He has a degree in mechanical engineering from the University of Denver and two degrees from UC San Diego: a master’s in materials science and a doctorate in engineering. All of the astronaut candidates will undergo two years of training, then will be assigned to NASA’s Astronaut Office performing “technical duties” while awaiting possible flight assignments. 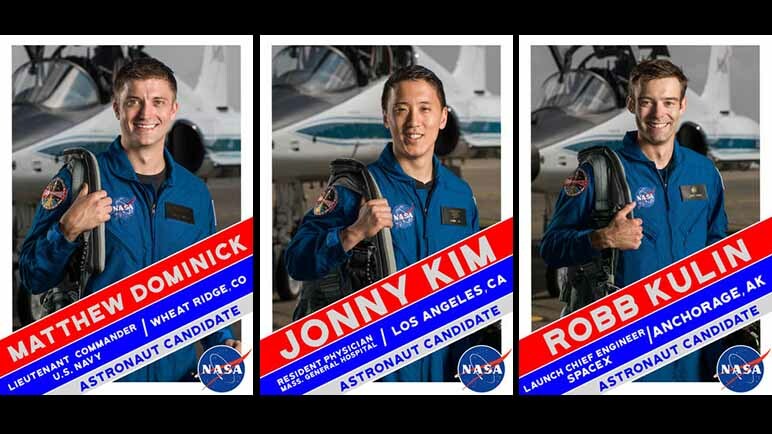 They’ll join a legion of former astronauts with San Diego connections, including Sally Ride, the first American woman in space; Ellen Ochoa, the first Hispanic woman in space; and Kate Rubins, who spent for months on the International Space Station last year.